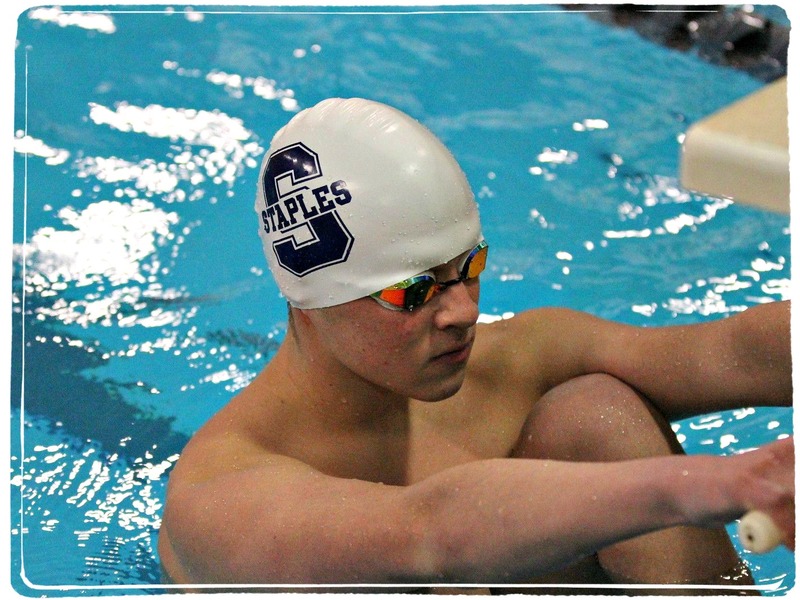 Stop (Or Start) The Presses: Staples Swimmers Sink Greenwich! The Staples High School boys swim team is making quite a splash this winter. But — at least in the local media — they haven’t even caused a ripple. Last week, the Wreckers beat Greenwich. The last time that happened was 1979 — nearly 40 years ago. And the time before that — Staples’ only other swimming win over the Cardinals — came in 1970. That day, the water in the small Westport YMCA pool was so murky, no one could see the turns. How good is Greenwich? Under coach Terry Lowe, they’ve won 34 state open championships, and 24 class LL (extra large school) crowns. They’ve also won captured a mind-boggling 46 FCIAC titles, over the past 47 seasons. They make the Yankees and Celtics of the 20th century — or, more recently, the Patriots — look like the early New York Mets. Yet last week, Staples out-swam the Cards. In fact, they drowned them. The final score was 110-76. It was quite a victory for the Wreckers. And for first-year coach Jeff Bonaccorso. That’s right. This is his rookie season with this high school team. He took over after Frisk Driscoll moved to Fairfield University. Of course, Bonaccorso is hardly a fish out of water. 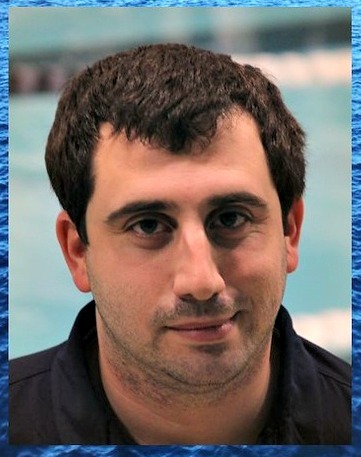 He’s aquatics director at the Westport Weston Family Y — and in the fall, coaches the Ridgefield High girls squad. The Staples/Westport Y connection is strong. Many Wreckers grew up in the Water Rats program, directed by the legendary Ellen Johnston. Most continue to compete on both teams — even during the high school season. That’s true for Staples 2 captains, Josiah Tarrant and Scott Adler. They began swimming almost before they could walk. Pool water courses through their veins — and they race through their lanes faster than everyone else. Still, both were a bit apprehensive when Driscoll left. Entering the season, the captains had high hopes. They finished 3rd at last year’s FCIACs — and graduated only a few, non-scoring seniors. Two weeks before the Cardinal meet, Staples met the Tigers — a team with 5 great swimmers, including 2 Olympic trial hopefuls. What Adler calls “the most exciting and closest dual meet of my life” — with an “insanely loud” home crowd — came down to the final relay. Ridgefield won. But by placing 2nd and 3rd, the Wreckers amassed enough points to eke out a 94-92 victory. Josiah Tarrant in action. 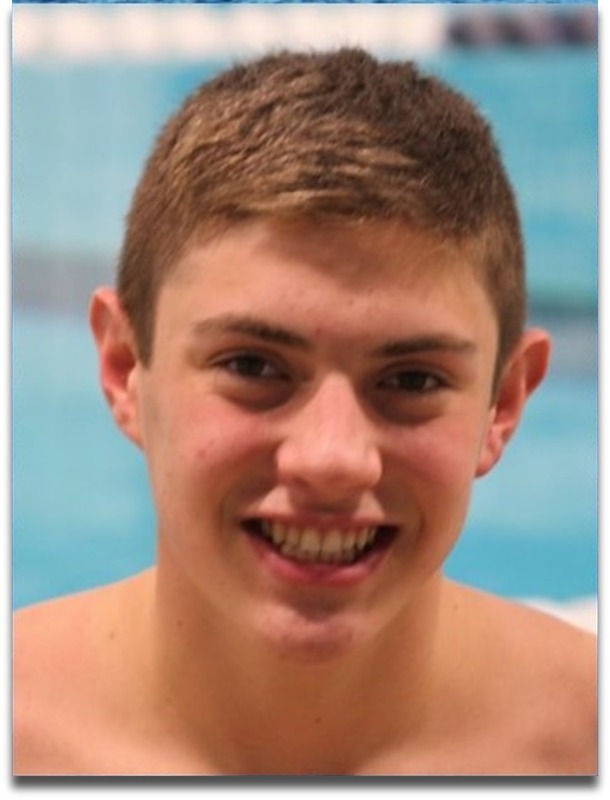 He swims the 50 free, 100 butterfly, and anchors the 200 medley and free relays. Again at home — with more packed, roaring fans, including the girls’ team — Staples took down the state’s most legendary swimming power. Their rigorous practice schedule — and all the coaching, from Johnston, Driscoll and Bonaccorso — are paying off. “Everyone thinks swimming is an individual sport,” Tarrant notes. “At the club level, it is. But on the high school pool deck, there’s so much camaraderie. “It’s not just about the fastest guy. The 5th guy gets a point, and every point matters. “It’s nice to see a direct connection between hard work and the end result,” Adler adds. “You really see it come to fruition. The FCIAC meet is February 27-March 1 — at Greenwich. Hey, why not?! Then come the state LL and open championships. Scott Adler gets ready for the start of his backstroke race. It won’t be easy upending Greenwich in the post-season. The Cardinals have a ton of swimmers — they brought 2 busloads to the dual meet — and numbers count. But one thing is certain. When the record board that hangs over the Staples pool is updated in March, nearly every event will now include a 2018 swimmer. You may not read about the Wreckers’ accomplishments elsewhere. But this year’s team has written a new chapter in the history books. 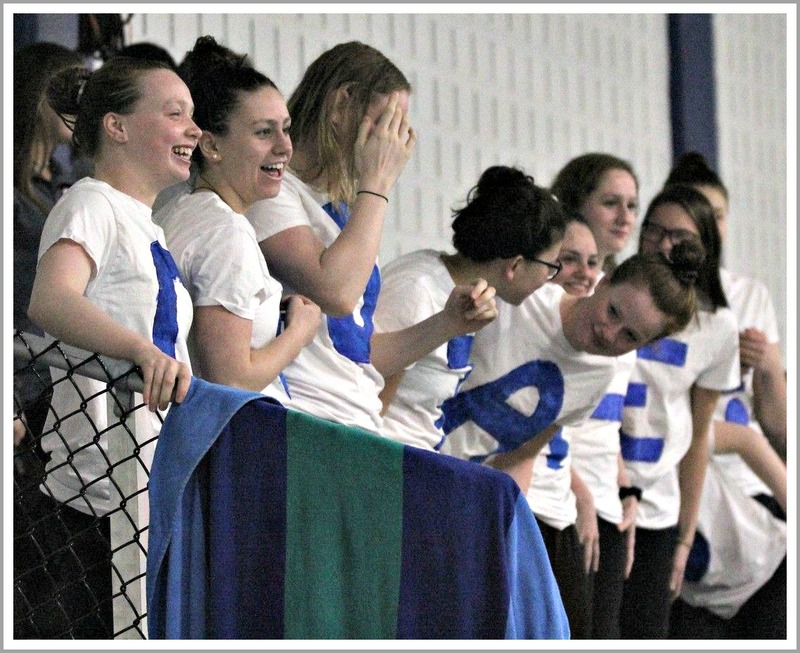 The Staples girls swimming and diving team provided great support at the Greenwich meet. 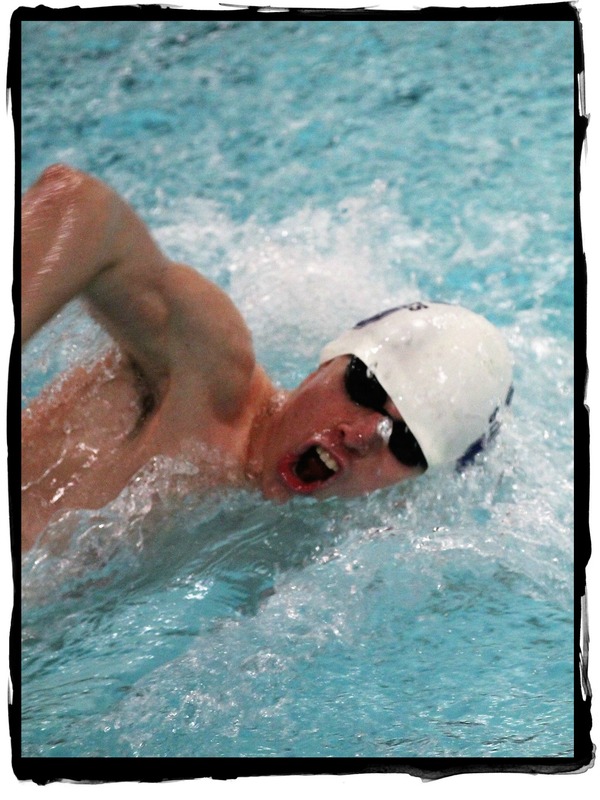 This entry was posted in People, Sports, Staples HS, Teenagers, YMCA and tagged Frisk Driscoll, Greenwich High School swimming team, Jeff Bonaccorso, Josiah Tarrant, Scott Adler, Staples High School boys swim and dive team, Westport YMCA Water Rats. Bookmark the permalink. Dan, thank you so much for you support, both for the Staples swim team and the WRATS, and the coaches. Great story – I enjoy reading about Staples teams even if I know nothing about the sport. It is so important that students belong to something – a team, a club, an activity. Just belong! Go Wreckers! Having attended MANY Staples swim meets in the past, I fully appreciate how exciting this was for the team. Way to go Wreckers! And rock those blocks at championships! Thank you so much for the great story on our 5-0 Wreckers team! We couldn’t do it without so many amazing talented swimmers. We have 3 more home meets to go—I invite everyone to come checkout a Staples High School meet! Dan — I love your puns! Congratulations to our amazing student athletes. It takes a lot of dedication and practice. And this win is so well deserved. Woohoo!!! As both an alumnus of GHS who swam for Terry Lowe (albeit not at GHS) and a parent of past Staples swimmers, I deeply appreciate the significance of this event. Bravo Staples! Well done indeed. Way to Go Wreckers!- a testament to heart and great coaching. Winning seasons don’t just happen- these boys finally had depth, wanted it, worked for it and deserve it! and glad they got some press. Great article about a great team effort thanks Dan! May I also mention that I was a member of the 1970 team that defeated Greenwich in the Y’s 20 yard Brophy Pool. We were used to the less than optimal water clarity and had learned to count our strokes to determine the location of the wall. Every team counts legendary events in its history, this and the current victory will be two of them. Any chance that Scott Adler is related to Cy Adler, Staples Swim Team and class of ’58? It is so good to see this post. In 1958 we had only a Men’s Swim Team and it looks like just 13 members and two coaches. My ’58 year book says that it was the first year for a Swim Team. The year book reports that the team came in second in the Southern Division of the State after a three way play off with Greenwich and Stratford. The team “finished fifth in a field of twenty five of the best teams in the East.” Congratulations to this year’s team and their accomplishment. Confession. I posted with out reading all the comments. 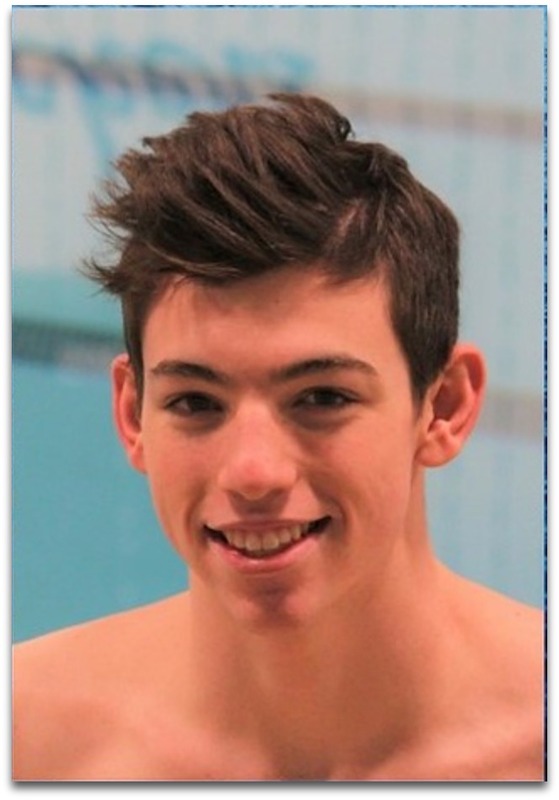 (I am the mother of two ex High School swimmers so I love following the sport. One son was part of a relay team that broke a state record and the other held a pool record for the mile for a long time but that is beside the point.) Joe Brophy was on the first Staples team in ’58 and was the co-captain with Alan Doldge. any chance that the Brophy Pool is named for him or his family? Wow! This is a great accomplishment. I can imagine how much time, effort and sweat (yes, swimmers sweat) went into making this happen. Congratulations to the entire team, Coach Bonaccorso and his coaching staff and the rest of the Staples swimming supporters. Dan, thanks to calling attention to an often overlooked sport where kids have the opportunity to learn lifelong lessons of goal setting, dedication, persistence and teamwork. Perhaps there’s an “Unsung Hero” in the future on this blog for Ellen Johnston. I know generations of folks that would be supportive of that accolade. THIS IS AMAZING!!! Great job Jeff and the team. I think a lot about how there is so much less reporting on certain high school sports than there used to be. That’s why I started the Friends of Staples Water Polo Facebook page. It isn’t a good substitute, though. If anyone has a better solution I’d love to hear it! I know what it felt like in 1979 and it was incredible, so I know what an incredible job it is to “take down” a Terry Lowe Greenwich team. 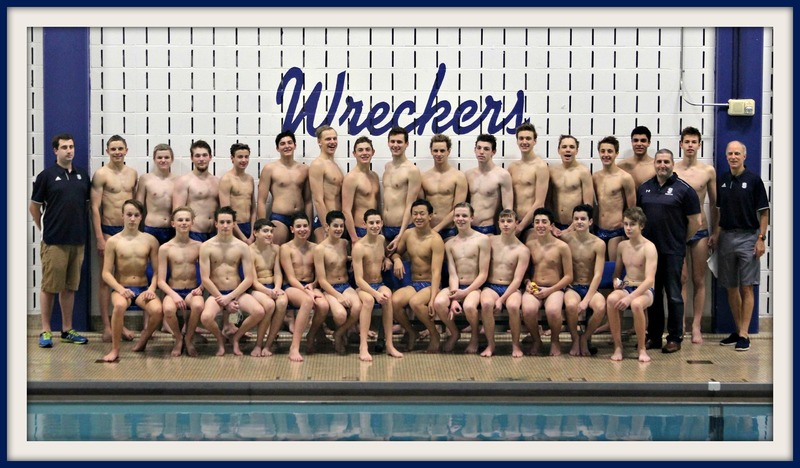 Congratulations to all you Wrecker swimmers, coaches and the families that I am sure support you to the fullest. Get out and show your support Staples students, teachers, and Westport families. Cheers and keep up the great teammanship that makes these victories happen.